Read what our current and former clients have to say. 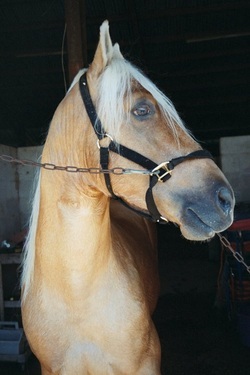 I have had my horse at Amulet Equine for 3 years. 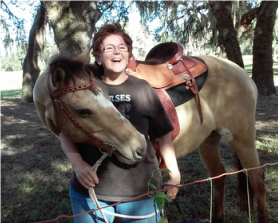 Sandy (my quarter horse) is very happy here. I recently started taking lessons from Lainey (I am 69 years old and Sandy is my first horse) and I have learned so much!! I love the way Lainey explains what she wants me to do and then tells me the reason to do it that way. I would highly recommend Lainey as a trainer and Amulet as a boarding facility. Lainey and Jack treat all the horses as if they are their own and I never worry when I am traveling. I call Amulet Equine "My Happy Place" because that's how I feel when I am there. I have had my horse at Amulet Equine for 2 years. Achilles was a young, undisciplined, bordering aggressive horse when Lainey took him in, when a lot of other facilities were not willing to. I noticed a difference almost immediately in his behavior and demeanor. With just a bit of the right education for him, and especially for us, we were on the right road to enjoying our horse. It has been a wonderful experience getting to know our horse and all the valuable lessons and wealth of information that Lainey has passed on to us. He has always been treated as one of their own, and not just a client's horse. I honestly believe that if we had not met Lainey when we did, we would no longer have Achilles. It truly turned out to be a blessing for both horse and owner. We have had the best of both worlds at Amulet, as my then 9 year old daughter started riding lessons with Lainey and beautiful Miss Moyie. This experience has been one of he most enjoyable times of her life, even the few falls that she just laughed off. "Thank you" could never suffice for the gratitude that i have for this boarding facility. I had never used a hauling service to transport my horse before so was very nervous but I am beyond happy with Amulet’s service. They let me know when they were close so I could get my horse ready. They offered to help load him and coax him in. He didn’t go in at first and Lainey was very patient with us. I drove behind them the whole way from Brooksville to Sarasota and their driving was perfect. Once we arrived they helped me unload and offered to hold him while I get things situated. ​Amulet Services were so professional and friendly, I couldn’t have asked for more. Amulet Equine is a wonderful place to board your horse. 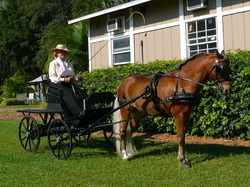 Very knowledgeable and caring owners who treat every horse as their own. Lainey is extremely friendly and knowledgeable and I truly feel that any rider would benefit from taking lessons with her. In only our first lesson, I was improving my riding skills and in turn could feel my mare’s way of going improve as well. The great thing is that even though we were working hard we were still having fun. Only the best of instructors know how to alter and tailor a lesson program to match the individual needs of the horse and rider that they are working with and Lainey has that talent. Also, for me the lessons have a lasting impression, as many times practicing with my horse on my own I remember great exercises and advice that we learned in the last session and can apply them. There is logic and sense in Lainey’s methods and they work! Lainey is absolutely the best trainer I have ever had. She cares about the well-being of both the rider and the horse. She pushes you to succeed, but never makes you do anything that you are completely uncomfortable with. She has made me an all around better rider, and never let me quit no matter what the circumstance was. She was always there to help with anything I needed. I'm glad I've had the chance to meet her and let her help me go on with my dream. I know for a fact you will love her as much as I do! I have known Lainey for some time now and have always found her to be professional and very knowledgeable. I have a high strung American Shetland and when he has overdone it in the paddock, Lainey has been quick to point out if he's sore or scratched himself. She has also been great in helping me fine tune his supplements. To help him relax more, she's recommended a natural herb that's done wonders in improving his behavior. I've always found her to be very helpful, easy to work with and especially caring of my beloved pony. 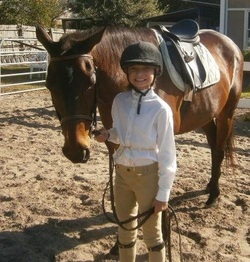 My 9 year old daughter has been training with Lainey for a year, she is a professional who knows her horses. Lainey and my daughter have a mutual respect and understanding, she never pushes her to do something uncomfortable and is always there for encouragement. I would highly recommend Lainey as a trainer to anyone. Lainey, I am going to miss you and the confidence you helped me achieve while you were training with Sunnie and me. Sunnie also got his confidence back up in his flat and running walk that you started training him back on as well. I always knew my Sunnie was in good hands and appreciated all your feed back and back up on Sunnie and his manners.